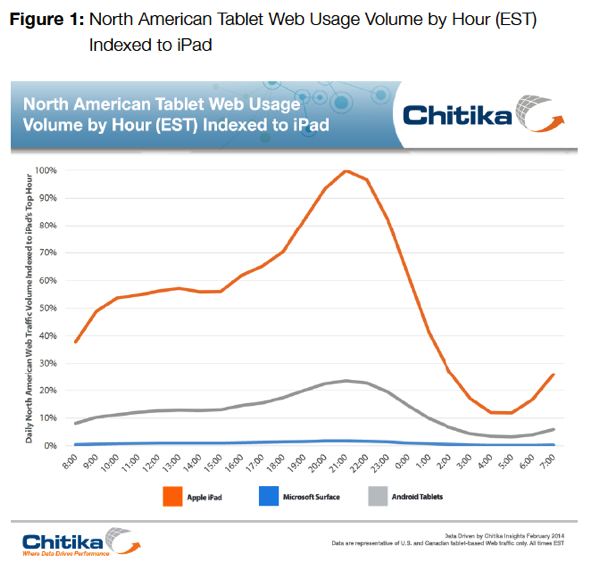 The iPad generates four times the Web traffic of all Android tablet users in the early morning, a recent study from Chitika has found. However, while the iPad clearly dominates the charts in terms of overall usage, the study apparently corroborates Microsoft’s claim that the Surface tablet is more suitable for work activities. As you can see from the above graph, the iPad is by far the most-used tablet from morning to late in the evening in North America in terms of raw volume. 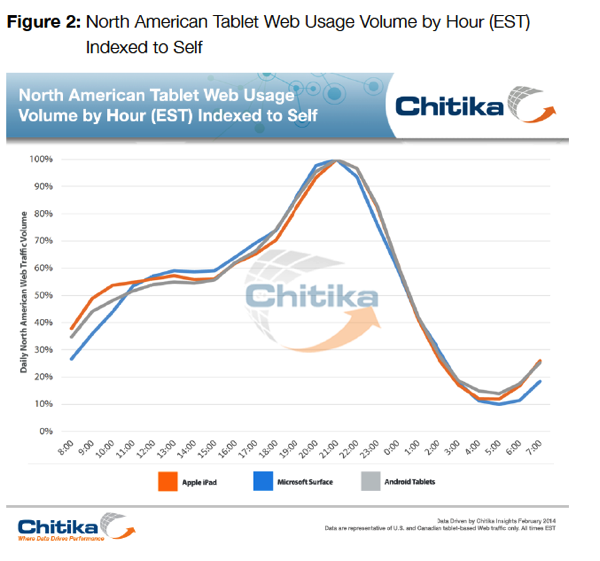 What’s interesting, though, is the chart below, which visualizes tablet usage hours in relation to their individual volume peak. The chart shows there is a small difference between the iPad and Android tablet usage rates, but the Microsoft Surface tablet shows a slightly higher usage between noon and 5 p.m. (how many Surface tables have been sold up to now?). Of course, the study cannot tell us whether during those peak hours the user reads email or watches videos, but the it does point to an interesting development: although the iPad is clearly the most-used tablet, the similarities in usage patterns (again, in relation to individual volume peak) show that Android tablets have caught up with the iPad in terms of functionality and other factors, the Chitika study concludes.